This case report details the clinical presentation, physical exam findings, and response to acupuncture treatment of Godrick, an approximately 10-year-old, neutered male, 27-kilogram mixed breed dog residing in the Humane Society. Godrick was selected by shelter veterinary staff for acupuncture treatment due to concern for osteoarthritis of his stifles (confirmed via radiography). A complete physical examination, including neurologic evaluation and myofascial palpation, revealed multifocal musculoskeletal pain and bilateral chronic wounds over the lateral elbows bilaterally. Treatment was initiated for multifocal osteoarthritis, chronic bilateral cruciate rupture, mid-to-lower back pain, and myofascial restriction. Godrick was also treated for anxiety, based on reports of pacing and vocalization while kenneled, as well as for chronic elbow wounds. Godrick received once weekly acupuncture treatments for a total of three weeks. Subjective improvement was noted by shelter kennel and veterinary staff, as well as by the author. Godrick was surrendered to the Humane Society six weeks prior to presentation. No reason for surrender was given. No previous medical history was provided. Medical records of the shelter intake examination note abnormal physical exam findings, including: focally severe periodontal disease, multiple subcutaneous lipomatous growths, and crepitus on stifle palpation bilaterally with decreased extension of hips and stifles. Vitals were within normal limits and cardiothoracic auscultation was unremarkable. An anesthetized dental cleaning with extraction of the upper left second premolar was performed one week prior to initial presentation for acupuncture treatment. Godrick was noted by shelter staff to be social and exuberant when out of his run, but anxious, vocal (barking), and pacing when confined. Clinically, he was otherwise well, with a normal appetite and ideal body condition. A complete blood count, biochemical profile, and total thyroid hormone were assessed one week prior to presentation and were within normal limits. Radiographs of hips and stifles confirmed marked, chronic degenerative changes of the stifles: periarticular new bone formation along the articular surface of the tibia bilaterally, mineralization of the left patellar ligament, and subchondral osteolysis bilaterally. The hips and pelvis were radiographically unremarkable. On physical exam, Godrick was excitable and overstimulated, but also friendly and eager to engage. Auscultation of heart and lungs, abdominal palpation, peripheral lymph node palpation, and external ocular and otic examinations were within normal limits. Abnormal findings included widespread dental wear and gingival recession affecting several premolars and a healing maxillary premolar extraction site. Multiple soft, subcutaneous growths ranging in size from 1-4 cm were present on the trunk and limbs. There were well-demarcated skin lesions on the lateral elbows bilaterally. The skin was thickened, inflamed and calloused, with a focal 3 mm ulceration on the left side. The surrounding fur was saliva-stained. Godrick was noted to have good muscle tone and symmetrical muscling. Gait evaluation revealed kyphosis of the lumbar spine, outward rotation of right pelvic and thoracic limbs, unloading of the right pelvic limb at rest, occasional hopping at a trot, and a slight occasional head bob when the left forelimb was placed. Decreased extension of the elbows and elbow joint crepitus were noted bilaterally but were more pronounced on the right. Bilaterally, there was decreased extension of the hind limbs at the hip, and Godrick avoided full extension or flexion of either stifle. Both stifles also had pronounced medial buttress, marked crepitus, and increased cranial translational movement, but changes were more notable on the right than left. On myofascial palpation, taut bands were found in the left masseter muscle, bilateral omotransversarius muscles, rhomboideus muscles, trapezius muscles, muscles of the scapulae bilaterally, and bilateral triceps muscles. The superficial muscles of the trunk and associated fascia were tightly adhered from the thoracolumbar junction through the sacrum. Twitching and pain (laying down) were observed on palpation of the thoracolumbar spine and sacrum. Godrick would not tolerate palpation of pelvic adductors or iliopsoas muscle. The following tests of neurologic function were performed and found to be normal: conscious proprioception in all four limbs, crossed extensor reflex in all four limbs (no inappropriate reflex found), and patellar reflexes bilaterally. A complete list of differential diagnoses considered included: osteoarthritis, other inflammatory (tendonitis, bursitis, synovitis, neuritis, meningitis), myofascial restriction, previous trauma or injury (primarily cranial cruciate rupture), chronic intervertebral disc disease (IVDD), organ dysfunction with referred viscerosomatic pain, congenital (i.e., elbow incongruity), infectious (i.e., coccidioidomycosis), neoplastic, immune-mediated (i.e., rheumatoid arthritis), or metabolic (particularly hyperadrenocorticism). Differentials for anxiety were limited to confinement anxiety and/or underlying metabolic disturbance (particularly hyperadrenocorticism). The chronic elbow wounds were considered secondary to underlying arthritic pain and/or possible bursitis, versus anxiety or metabolic derangements that could contribute to dermal changes. Putative Diagnoses Treatment was initiated for bilateral chronic cranial cruciate ligament rupture, mid-to-lower back pain, multifocal osteoarthritis (osteoarthritis confirmed in the stifles, but elbow osteoarthritis considered presumptive), myofascial restriction, secondary chronic elbow wounds, and anxiety. Chronic intervertebral disc disease without neurological signs could not be ruled out without advanced imaging and was still considered a possible differential. Similarly, synovitis, elbow bursitis and/or incongruity, and periarticular inflammation such as tendonitis could not be ruled out but would be treated similarly to osteoarthritis. Given the patient’s signalment, systemically well presentation, radiographic findings, normal leukogram and biochemistry profile, and chronic, stable, non-progressive condition, organ dysfunction, neoplastic, infectious, immune-mediated or metabolic causes were considered unlikely. While the chronologic sequence for the development of Godrick’s multifocal pain was not known, all regions of pain were considered a continuum of the same pathology. 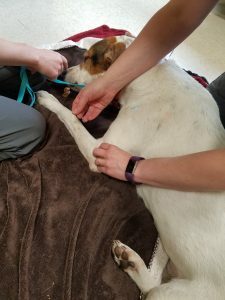 Whether the initial injury was in the stifle, back, neck, or forelimb, compensatory strain and referred pain had set in throughout his spinal column and all four limbs, resulting in multiple sources of tenderness, reduced range of motion, myofascial restriction, and inflammation. Godrick received once weekly acupuncture (dry needling) for a total of three treatments. Godrick’s high energy and anxiousness resulted in near-constant movement during his acupuncture sessions. He also would shake his body regularly, removing the majority of needles. For these reasons, points were selected with the potential for strong autonomic neuromodulation first, and relatively few points were used initially. Central and peripheral points that also had autonomic neuromodulatory effects as well as the potential to release trigger points and fascial restriction were preferred. Points were chosen largely based on patient position and tolerance. See Table 1 for a complete list of points used and their desired neuromodulatory effects. All needles used were Seirin J type 0.20 x 30 mm unless otherwise indicated. Following acupuncture treatment, Godrick received massage in areas that he would not tolerate further needling, namely the neck, shoulders, and distal forelimbs. He would not allow massage of the pelvic adductors. On follow up exam one week after initial presentation, a brief myofascial palpation revealed markedly improved comfort on lumbar and sacral spinal palpation. The remainder of the exam remained unchanged (tightness in neck, shoulders, and proximal forelimbs, medial buttress to stifles, adductor pain). Godrick was sweet and subjectively excited about his treatment. On the third visit, Godrick was observed to ambulate more smoothly, and although he still had areas of muscle tautness, he was generally much less sensitive to palpation and had subjectively looser, more supple myofascia along his trunk. He did not display kyphosis. When walking, he was notably more relaxed. The ulcerated area on his left elbow wound was smaller and contracting. 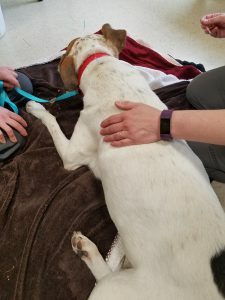 Multiple members of the kennel and animal care staff noted that Godrick was able to stand from a sitting position much easier than previously. His attending veterinarian noted an improvement in gait. No adverse events were reported. His improvements were attributed to acupuncture treatments, as no other medical treatments had been instituted. Although Godrick responded well to his acupuncture treatments, low level laser therapy (LLLT) would have been an ideal complementary modality to treat areas in which he would not tolerate dry needling, and to facilitate healing of his chronic elbow wounds.6,7,8 His acupuncture sessions were limited by his anxiousness, pacing, and propensity to shake out needles, issues that would not be a concern with LLLT. Further sessions are tentatively planned with Godrick, as long as he remains a resident at the shelter. Future treatment will be limited to what he will tolerate. Although improved, he still has significant pathology to address. With time, he may allow treatment in sensitive areas such as the neck and adductors, especially if LLLT can be procured. The author’s sessions with Godrick provided clinical experience that reinforces evidence in scientific literature demonstrating the beneficial effects acupuncture for osteoarthritis, back pain, anxiety, and wound healing.9,10,11,12 The primary lesson learned was that the most limiting factor in any treatment plan for veterinary acupuncture is the willingness of the patient to participate. And, following from this, the need to be flexible with treatment approach and accommodating of the patient’s emotional state and needs. 1. Yu JS, Zeng BY, Hsieh CL. Acupuncture stimulation and neuroendocrine regulation. Int Rev Neurobiol. 2013;111:125-40. 2. Wang R, Li X, Zhou S, Zhang X, Yang K, Li X. Manual acupuncture for myofascial pain syndrome: a systematic review and meta-analysis. Acupunct Med. 2017 Aug;35(4):241-250. 3. Field T. Massage Therapy Research Review. Complementary therapies in clinical practice. 2014;20(4):224-229. 4. Berg-Wolf M, Burgood T. Acupuncture and Cutaneous Medicine: Is It Effective? Med Acupunct. 2017 Oct 1; 29(5): 269–275. 5. Ma C, Sivamani RK. Acupuncture as a Treatment Modality in Dermatology: A Systematic Review. J Altern Complement Med. 2015 Sep;21(9):520-9. 6. Cotler H, Chow R, Hamblin M, Carroll J. The Use of Low Level Laser Therapy (LLLT) For Musculoskeletal Pain. MOJ Orthop Rheumatol. 2015; 2(5): 00068. 7. Gagnon D, Gibson TWG, Singh A, zur Linden AR, Kazienko JE, LaMarre J. An in vitro method to test the safety and efficacy of low-level laser therapy (LLLT) in the healing of a canine skin model. BMC Veterinary Research. 2016;12:73. 8. Hopkins JT, McLoda TA, Seegmiller JG, David Baxter G J. Low-Level Laser Therapy Facilitates Superficial Wound Healing in Humans: A Triple-Blind, Sham-Controlled Study. Athl Train. 2004 Sep;39(3):223-229. 9. Manyanga T, Froese M, Zarychanski R, Abou-Setta A, Friesen C, Tennenhouse M, Shay BL. Pain management with acupuncture in osteoarthritis: a systematic review and meta-analysis. BMC Complement Altern Med. 2014; 14: 312. 10. Lizhou L, Skinner M, McDonough S, Mabire L, Baxter GD. Acupuncture for Low Back Pain: An Overview of Systematic Reviews. Evid Based Complement Alternat Med. 2015; 2015: 328196. 11. Pilkington K, Kirkwood G, Rampes H, Cummings M, Richardson J. Acupuncture for anxiety and anxiety disorders–a systematic literature review. Acupunct Med. 2007 Jun;25(1-2):1-10. 12. Lee JA, Jeong HJ, Park HJ, Jeon S, Hong SU. Acupuncture accelerates wound healing in burn-injured mice. Burns. 2011 Feb;37(1):117-25.